Emphasis on the early years. Teacher hands out test to be taken with a #2 pencil. The "Step Test." It's sent to California and graded in a new way; by computer! Washington State University is in my home town of Pullman, WA. It has a science fair. On display, an out of date (even at that time) computer with vacuum tubes. Took up one entire classroom. "My Weekly Reader," a children's magazine, had article on something even smaller than the transistor. Thousands of these tiny transistors could fit on a chip. Students in Mr. Nick's social studies class pick stocks to follow for an assignment. Those who have "IBM stock" get the most points at end of semester. Luckily, it didn't effect the grade. 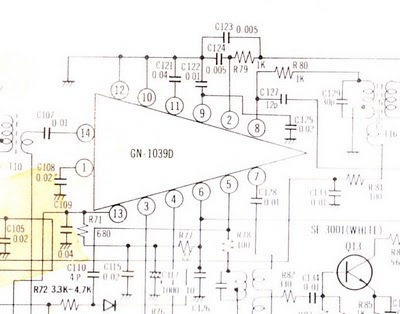 Below, schematic diagram of IF stage in Astronaut 8 radio with integrated circuit. My new radio features an integrated circuit. 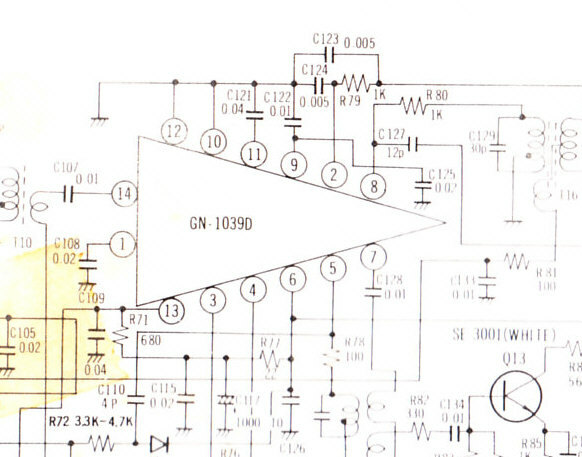 Part of the circuitry that is called the "IF stage" is mostly on one chip. "Astronaut 8" multi-band radio from Realistic. An electronic calculator at my father's lab replaces mechanical adding machine. Keypad and numeric display is connected to a central processor that serves 4 offices and is located downstairs. Not me, but someone else standing by teletype machine pictured in high school annual. Teletype terminal connects high school to Washington State University computer. It used the phone line. A bunch of whiz kids in mathematics hang out around it. Pictured in annual. I didn't spend time there as I figured I wasn't very good at math. At Western Washington University, Bellingham, I buy an electronic calculator for $89. Texas Instrument SR 10. Signed up for computer science because it was required for my major, but figured I might have to drop out. I wasn't good at math, but it was easier than I thought. Surprised myself and got an A. There was a room full of "key punch" machines where we typed our programs into stacks of cards. These were handed to the control desk at the computer center. Printout could be picked up next day; like getting film back from the developer. Western Washington University installs terminals for instant "turn around" from computer. One could sign up for an "account" on the system. Each account access some disk space and 8K of memory in the computer. Somewhere around 32 terminals shared the mini computer. I wrote programs in a computer language called "Basic." My senior project tabulated a survey from Bellingham city buses. It created a "rank order" table. Ranked bus stops by number of "passenger boardings" at each stop that were counted in the survey. Back in my home town of Pullman, I tour Washington State University computer center. That multi million dollar facility features massive computer with 2.5 megabytes of RAM! Wow! 2.5 megabytes. (Laugh). Phone lines connect WSU computer with users in various parts of the state to make most use of the system. Not only WSU uses it, but also Everett City government, for some reason, and a few other agencies around the state. "Must make best use of such a large system." On a tour, I learn that WSU students have to get funding approved, or be in a computer science class, before they can use WSU system. No "open access terminals" like the smaller computers at WWU allowed. I was horrified. Tour guide says WSU doesn't believe in "funny money." Students must apply for real money; like funding from their departments, which can be transfered over to computer center. Guide explains that, "students usually don't have problems getting the money approved." I ask, what if one just wants to learn by "playing" on the computer? WWU has smaller system, but access is much easier. A better system for learning by play. Back in Bellingham, graduation from WWU means loosing access to computers. At least loosing access until the much talked about "age of home computers," arrives. The bank I use gets it's first ATM machine. I buy an Ohio Scientific "home computer" with 8K memory. Used an old B&W TV for monitor. Cassette tape recorder served as long term memory. $500. Next year, I bought the printer for another $500. An Epson MX 80 dot matrix printer. Bellingham Computer Users Group (BUG) meets at Georgia Pacific offices next to the Pulp Mill. OSI computer and Epson printer. Not that great a picture and I gave items away in the 1990s. Click image to enlarge. Hear sound of data from OSI computer. See video with sound from OSI. Also see Texas Instruments calculator at work. About 1 minute. A coworker gets an "IBM compatible" with modem. He is sharing messages with "bulletin board services" over phone lines. Bellingham's Micro Madness BBS is going. Coworker dials across country to several BBS services including one in Boca Raton Florida. I buy a Commodore 64. Coworker thinks it's a mistake and suggests "take it back, get an IBM instead." I keep Commodore and get a modem for it. Try to send message to coworker, but something is goofy with the modem. He can see my type, but I can't see his. Someone from Commodore Users Group visits and we try cleaning crud off the phone connection at the old house I'm living in. See if that helps the modem. It doesn't make any difference. Commodore helps me organize my scrapbook of writings and letters to the editor by topic. Beginnings of the menus that are now on my site. Brothers and sisters are sending emails to one another for free. Clear across USA. They are using a mystical system called "Internet" which connects up universities and various institutions. Messages are sent from their university or city library workplaces. New custodial job, new coworker. Coworker takes me shopping to buy an IBM compatible. Also a 2400 baud modem. I dial my first BBS service. It's a gay oriented message board located in Seattle. Called "28 Barbary Lane." Long distance call. Coworker, a fellow custodian, explains the concept of "hypertext" to me. Buy my first optical scanner. It's B&W. I put one of the stories from my bicycle trips into "electronic book" form. To be shared on BBS services and eventually the Internet. WWU Alumni Association offers access to the Internet. I join and dial up a computer called "Henson." View email in a program called "Pine." My coworker has no ties to university. He is using America On-line. We await the much talked about "gateway" when AOL users get to exchange emails with other Internet users, Compuserve users and so forth. I try a function called "Telnet." This uses WWU computer to access other systems on the net, in "real time." I try Cornell University in upstate New York. Amazed at how fast it answers. I use Telnet to access several sites including NASA Spacelink. Fellow at a local potluck explains the World Wide Web and Mozilla to me. Waiter at Tokyo House Restaurant explains how I can trick Western's computer into thinking I have a "slip account" thus being able to look at the world wide web. My first browser is Netscape. WWU announces that Alumni will no longer be served by it's over burdened computers. Memo states there are several private companies providing Internet access now days. This isn't related to alumni accessing the slip account. It's just a sign of the times. One of the private companies is called "Pacific Rim Network," in Bellingham. Spring 1995, I set up my own web page at Pacific Rim Network. All fits inside 2 megabytes. My web address: http://www.pacificrim.net/~robert/ (no longer active). Start sending my "gay potluck newsletters" via email. It was a xeroxed and "snail mail" publication since about 1992. Circulation, around 100. Some friend of mine tries to access weather maps on-line, but computer says, "missing packet driver." We're baffled and jokingly look around Lake Padden Park for a missing packet driver. 2002. Gay potluck newsletter becomes a Yahoo Group. I also start an account at Blogger, but don't do much with it yet. 2004. Start posting prolifically to my blog. 2007. Upload my first Youtube videos. Hopefully, I'll get better at video. 2008, I'm on Facebook. This part added after 2008. What an excellent and concise summary of the decades of changes. Ever heard of the Pirate Chip?